The U.S. Mint will sell no more bullion Silver Eagles with the 2015 date. Sales ended at an annual record of 47 million coins. The United States Mint on Tuesday, Dec. 15, sold the last of the year’s American Eagle silver bullion coins, ending their 2015 annual sales record at 47,000,000 ounces. The U.S. Mint’s bullion purchasers will now have to wait almost a month to get more since next year’s edition doesn’t launch until Jan. 11. For several years now, the U.S. Mint has allocated sales of the one-ounce, .999 fine silver coins because of silver planchet shortages. Normally, bullion coin demand softens in summer months and the Mint is able to offer as many as buyers want. That didn’t happen this year with falling silver prices making American Silver Eagles more affordable and attractive. And with orders sharply higher in the summer, the Silver Eagle’s previous sales record was shattered by Nov. 30 despite comparatively weaker performances in May and June. Produced annually since 1986, the bullion coins have posted their five best years in 2010; 2011; 2013; 2014; and 2015. That old record was notched last year at 44,006,000 coins. The 2015 annual sales record ends 6.8% higher with 2,994,000 more coins. In 2015, monthly sales of American Silver Eagles ranged from the May low of 2,023,500 coins to the January high of 5.53 million coins. December sales closed at 2,333,500 coins, down from last month’s 4,824,000 coins. 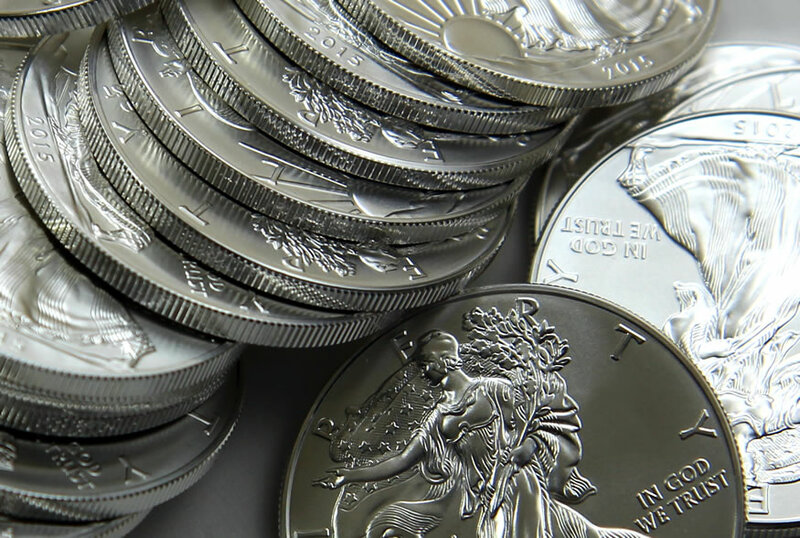 The U.S. Mint does not sell American Eagle silver bullion coins directly to the public. They are instead sold through a network of authorized purchasers. AP’s, consisting of major coin and bullion dealers, brokerage companies, and other participating financial intermediaries, pay the U.S. Mint $2 more than the spot value of each coin they order. Consumers are paying from about $4 to $5.50 per coin over spot. The absence of supply over the next several weeks may drive premiums higher.